On Wednesday evening we received a phone call from the ESRD, indicating that another 13 wild horses had been caught and were being transported to Innisfail. Seeing that we had already taken in 5 horses on Tuesday, we knew that it would not be too long before we had to rescue more. 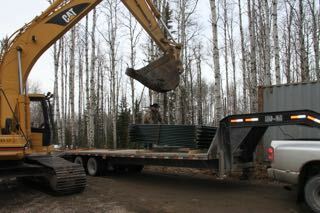 We were working on a hectic schedule which included having to purchase another $9,000 worth of panels and another shelter in order to be ready. As I have stated before, this is because we were caught unaware of the capture of the wild horses that is happening now. We had not expected to expand until the summer. Gratefully we have a strong core of volunteers who sprung into action. Wednesday, prior to the phone call, was spent running into Calgary to pick up the panels, then to Caroline to pick up the shelter. While this was being done, others worked on getting the site ready where new pens were to be set up to facilitate the safe environment for the newcomers. Then on Thursday, after the call went out for help, we had a good group of volunteers show up to help start setting up these panels as we knew we had to rescue more horses later that day. With everyone’s help, and especially the use of a bobcat that was brought by one of the volunteers, the job went very quickly. 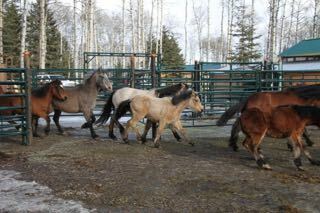 After that another crew responded to Innisfail to select the young horses that had been caught and that we were confident we could handle and find adoptive homes for. This is always extremely hard for our members as we wish we had the resources and people to be able to consider taking them all. Unfortunately this is not the case at this time, maybe in the future as we continue to grow. Of the 13 new horses, we selected 8 that fit into our program – four colts and 4 fillies. That left 3 stallions from Tuesday and another 5 stallions today, all older than 3 years of age that we had to leave behind. 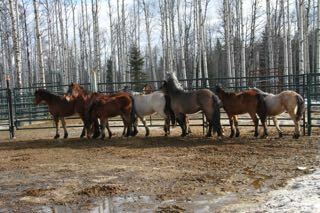 These horses will be up for auction on February 28. 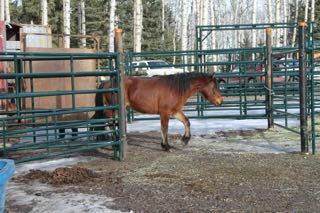 However, we are working with a couple of horse ranchers who may be able to step in and take these boys. We have our fingers crossed. Again from the loading to the unload, our new wards surprised us with the ease they loaded and the calmness when they unloaded. The 5 other boys greeted them with excited whinnies. Of course they were a little bit excited with what has happened to them the last few days. It did not take long, however, for them to start to settle down. It was great to see that the youngest of them all was the first one to find the scrumptious green hay. There is a lot of colour in this last group as you can see. To us though they are all equally beautiful. As with the other five, they will be left alone to settle down and become accustomed to their new surroundings. We have had donations of hay, which we are extremely grateful for as it will provide great nutrition for all the horses while they are under our care. We are receiving a large number of emails requesting information on adoption and we are trying our best at this hectic time to respond to them all. In light of this, we will be emailing all those that expressed interest an application form that will be required to be filled out. This is in order to ensure that anyone who adopts these young horses has the proper setup and knowledge to be able to deal with a wild horse. 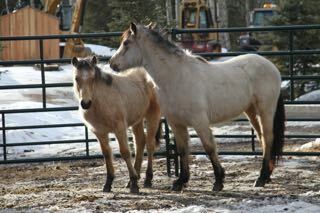 The adoption fee we charge goes right back into our work to protect and save our Alberta wild horses. These horses will remain with us until we can be assured that they are safe to handle and also that any colts have been gelded. We do cover that cost. The season still has nine days to go and there is no doubt that WHOAS will be called upon to rescue more. We will answer that call. It is so amazing that you are doing that, and rescuing so many horses. Fantastic job!